Prosise has played just 11 games in two previous seasons with the Seahawks as he enters what looks like a make-or-break year to forge a role on the team. In the latest setback for oft-injured Seahawks tailback C.J. 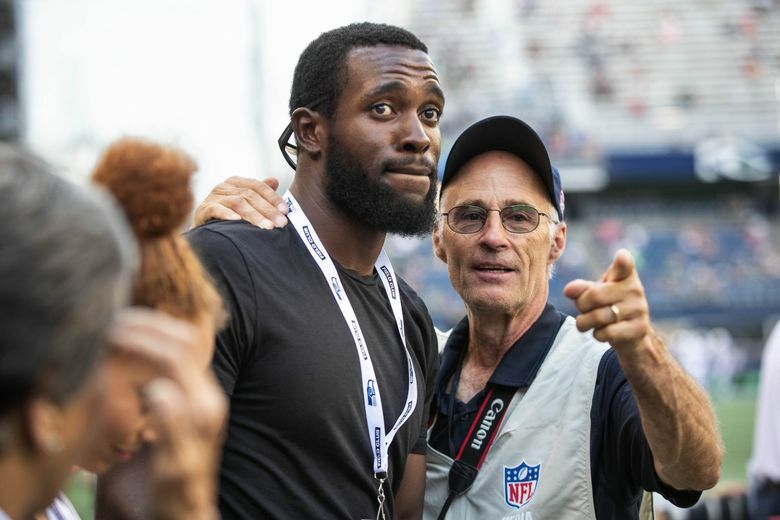 Prosise, the third-year player missed Thursday’s preseason opener against the Colts with what was described as “a little hip injury’’ by general manager John Schneider during his regular appearance on the team’s pregame radio show. Seahawks coach Pete Carroll said after the game that Prosise felt the hip flare during the team’s final practice before the game on Wednesday. He said Prosise did some running in the pregame workout but it was decided he would be held out. But while the injury sounded minor in the way Carroll and Schneider described it, any setback is an issue for Prosise given his history in two years with the team after being taken in the third round out of Notre Dame in 2016. Prosise has played in just 11 of a possible 32 regular season games in his first two seasons with the Seahawks. He has seemed like he’s in a good spot to make the roster given his status as a third-round pick in 2016, the overall lack of numbers at the position, and a few moments when he has showed his potential. But any prolonged absence could open the door for Seattle to go in a different direction for the third-team/two-minute back role that has been Prosise’s primary duty. Until now, Prosise appeared to have shaken off the injury bug so far this year. He participated in all of the team’s offseason program, and was in every practice that was open to public/media before being hurt this week. Every Seahawk who was on the field stood for the national anthem. However, three stayed in the locker room rather than stand on the sidelines for the anthem – left tackle Duane Brown and defensive linemen Branden Jackson and Quinton Jefferson. Brown, Jackson and Jefferson were all among the group of Seahawks who sat for the anthem last season and Brown said after the game Thursday that the three were making a statement again this season. Brown, Jackson and Jefferson were all among the group of Seahawks who sat for the anthem last season. All confirmed after the game they stayed inside for the anthem as a method of protest. Carroll had said previously that whatever the Seahawks did they would do together and he said he considered what happened Thursday as keeping with that stance since everybody knew what the three players were going to do. The NFL has no current stated policy on the anthem. However, it proposed in the spring that any players on the sideline had to stand for the anthem or face a possible fine, the league also stated that players could remain in the locker room if they wished. Brown said he anticipates staying inside for the anthem all season. The Seahawks’ opening offensive line was the same as it has been throughout camp with Brown at left tackle, Ethan Pocic at left guard, Justin Britt at center, D.J. Fluker at right guard and Germain Ifedi at right tackle. Ifedi has been benched/demoted twice in the last week during camp — in Saturday’s mock game and in Tuesday’s practice — after committing penalties. He was flagged 20 times last season and the Seahawks have said they need him to clean that up as he enters his third season in the NFL. However, the Seahawks may have been sending Ifedi some sort of a message as he was the only starter who remained in the lineup at his usual position when the Seahawks went with their second-team offense for their second series. That lineup featured Ifedi at right tackle and Pocic at center along with backups George Fant at left tackle, Rees Odhiambo at left guard and Jordan Roos at right guard. The game marked the first time the Seahawks got game action with the NFL’s new kickoff rules, which allows only three players to be stationed beyond the 40-yard line on a usual kick from the 35. As had been anticipated, the Seahawks reacted by placing three returners deep. J.D. McKissic lined up deep in the end zone on each of the first three kickoffs, with running backs Chris Carson and Rashaad Penny stationed at the 20. The first kickoff went for a touchback, but McKissic returned the second 29 yards. The third was also a touchback. Tyler Lockett is listed as Seattle’s starting kickoff returner, but the Seahawks appeared to be giving the reps to McKissic instead. Both of the Seahawks kicking spots — kicker and punter — feature interesting two-person battles. From there, the Seahawks just alternated kicker and punter. Dickson and Ryan each had three punts (Dickson averaging 50.0 yards with one swirling punt fumbled) and Ryan 46.3. Myers hit a 43-yard field goal in between two point after touchdowns by Janikowski. Dickson also tossed in a dropped-kick kickoff in the second half. — There were no other surprises to the players who did not see action aside from Prosise. Among those sitting out were receiver Doug Baldwin, defensive ends Frank Clark and Dion Jordan, tight end Ed Dickson, cornerbacks Byron Maxwell and Neiko Thorpe, all potential starters or key players. — Ryan, linebacker Bobby Wagner and quarterback Russell Wilson were the captains for the game. Those three, along with Kam Chancellor, were Seattle’s regular season captains last season. — Chancellor is out for the season but was on the sideline for the game. He also visited the team during practice one day earlier this week and has said he plans to be around the team regularly.